BACK Construction would love to remodel your bathroom when you’re ready to have a luxurious, relaxing space where you can begin and end your day right. At BACK, we believe that creating dream bathrooms doesn’t have to be an arduous process, which is why we take so much pride in the exceptional, stress-free experience we provide our clients in Lexington, Kentucky. As we take your drab, outdated bathroom into the twenty-first century, we’ll work hard to show you why we are such a popular bathroom remodel company in the region. 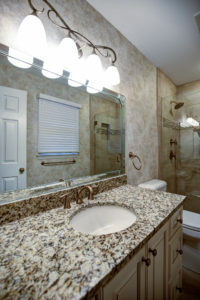 Once you know what you want incorporated in your bathroom remodel, we will then put your ideas to paper. Our designers will create 3D renderings based off the information you provide and then collaborate with you further until every detail is in place. Once you’ve approved the renderings, installation can begin. We count on some of the most talented and skilled technicians in the field to carry out our work. Our installations are so impressive that they are backed with our five-year workmanship guarantee. We build it BACK better, and this is a statement we have lived up to since our founding in 1981. To learn more about the bathroom remodel projects we complete throughout Lexington, KY, and surrounding cities, contact BACK Construction today.